Over my years here I've been to Keyano Theatre many, many times. My family has enjoyed musical performances, plays, ballets, company Christmas events, and children's performers. Just in the course of writing this blog I have been there several times. On Saturday night, though, I went to Keyano Theatre for a very special event - their annual "curtain raiser". The "curtain raiser" is a fundraiser for the theatre, and I was intrigued when I heard it advertised. My interest was piqued for several reasons - there was going to be a wine tasting, hosted by the Opimian Society (the local branch of that wine aficionado group). There would be a post-show reception from the Sawridge (one of my favourite places for food). 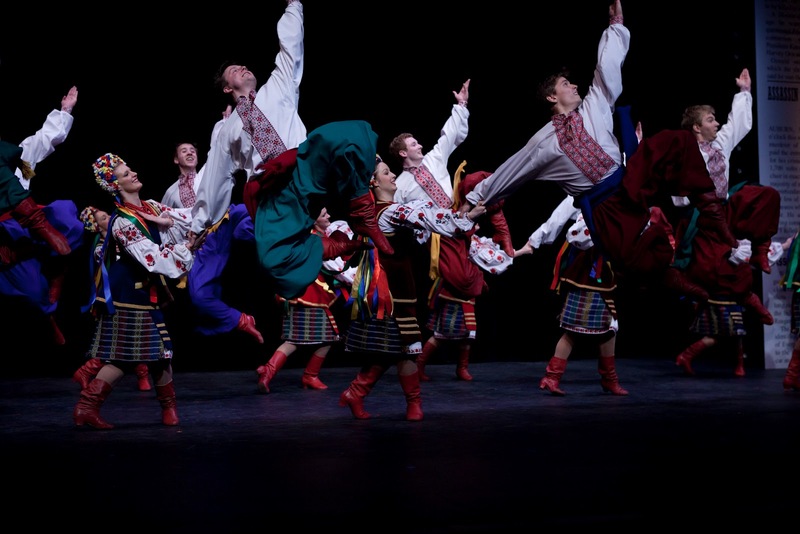 And there would be a performance from Shumka, the Ukrainian dance troupe from Edmonton. I've seen Shumka before, you see, decades ago in Saskatoon. I'd enjoyed their performance then, and suspected I would again. My husband happens to be half-Ukrainian, and between the Ukrainian dancers and the wine tasting (both of us enjoying a nice wine) it was pretty easy to sell him on the idea of attending. So, I purchased our tickets, and Saturday night found us arriving at Keyano in a taxi (because we intended to make the most of the wine tasting). We walked into the theatre lobby and were delighted to see it transformed. Where there is usually empty space stood a bar, and suspended from the ceiling above it was a beautiful circular decoration made of colourful ribbon. 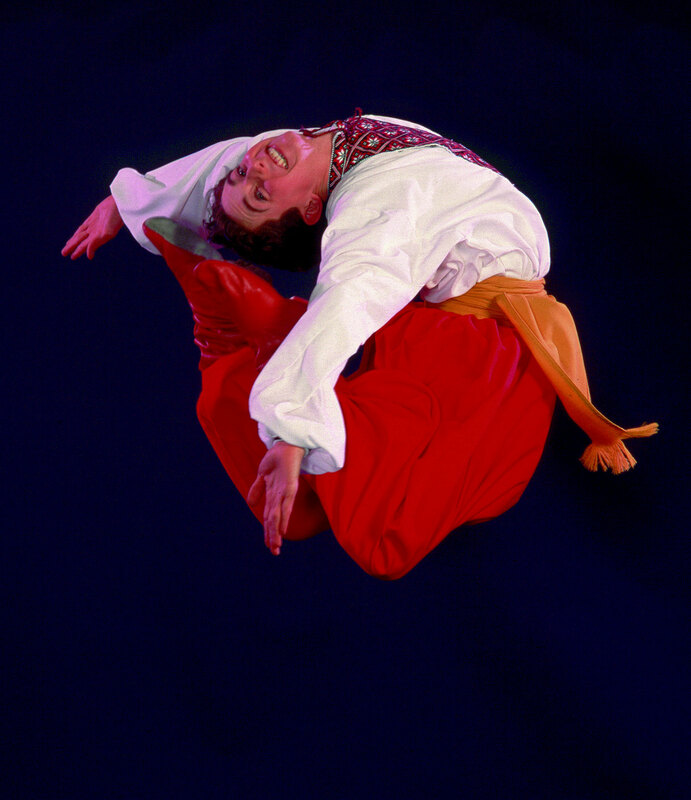 The ribbon, all different colours, was repeated throughout the decor, and obviously in honour of Shumka, which showcases colourful costumes and ribbons. As you continued through the lobby you eventually arrived at the silent auction items (one of which, a basket of wines, made my husband enter into a bidding war). And then there was another bar - and the wine tasting. There were several tables, each hosted by an Opimian society member or two, and a few select bottles of wine. Tickets in hand we began tasting, me the whites and roses, and my husband the reds. Between selections we chatted and visited with some of the many people in attendance, from those we know from the Opimian Society to those who are friends from other places. We quickly ran out of tickets and had to purchase more (and the hiring of the taxi seemed a particularly clever idea at this point). And if we became bored there was always "Easy" and "Peasy", two local actors who served as busker-style entertainment, and the young man playing the accordian (an instrument I know well and grew up listening to as my German father played it every day and had his own polka band for years). The wine tasting was truly a lovely start to the evening, and although we had arrived shortly after 6 pm the time flew by quickly and soon it was time for the 8 pm performance of Shumka. 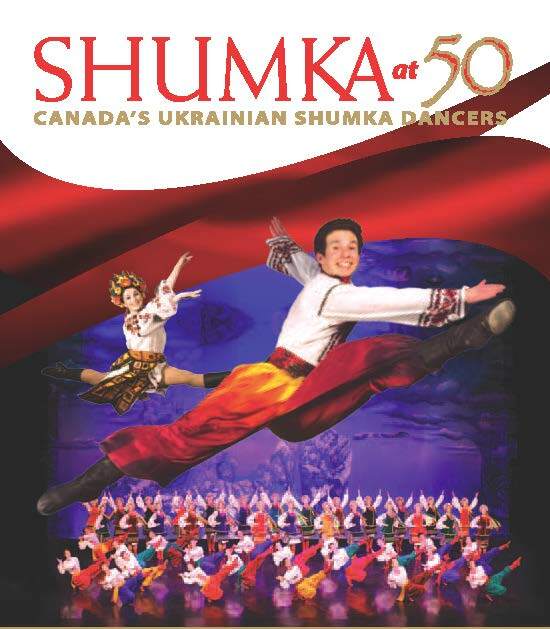 Shumka is a dance group now 50 years old. That seems remarkable, and it is. 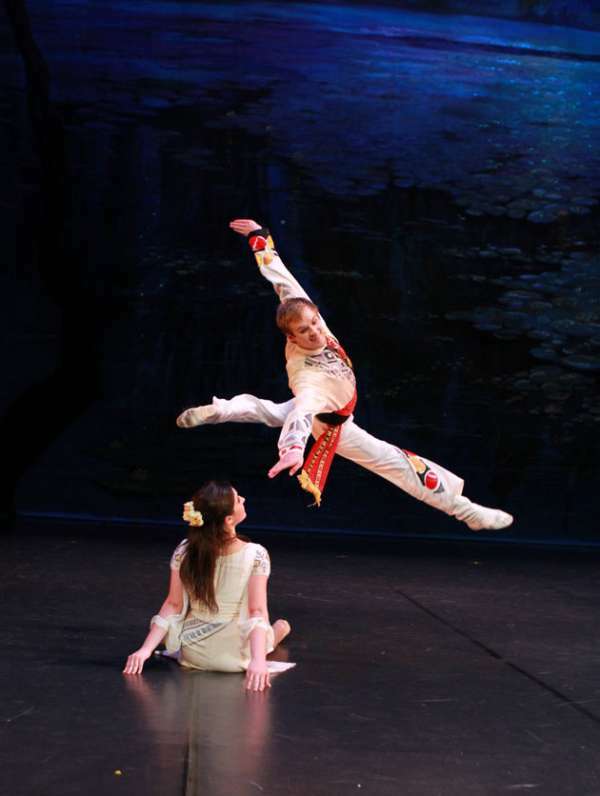 What is even more remarkable, though, is how Shumka has evolved. 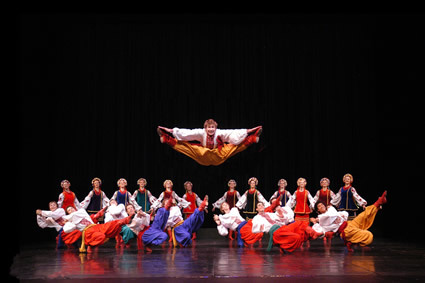 You see, when I saw Shumka about twenty years ago they were very much just traditional Ukrainian dance. It was lovely, but it was not modern. It was not contemporary. And, I think, had they continued to only pursue traditional dance they would not have survived to see 50 years. But Shumka is no longer "just" Ukrainian dance. In fact they aren't "just" anything. They are, as several people said that night, "astonishing". I've never been to a performance of ANY kind where there was a standing ovation at the intermission - and not because people thought it was over, but because they were simply overwhelmed by what they had seen. Shumka still incorporates traditional Ukrainian dance, and those beautiful costumes. 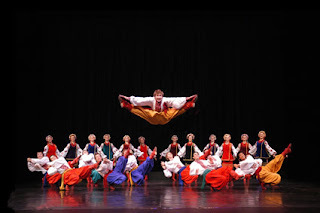 They still do the high leaps and the whirling dervish-type moves, and the amazing kicks. They have become so very, very much more, though, weaving in modern interpretive dance, telling traditional tales in delicate fashion, and yet with an energy and intensity that takes your breath away. There are moments of sorrow, moments of humour, and moments of whimsy. The performers on the stage are in constant motion, and it is a feast for the eyes, with costumes of a beauty and intensity that simply mirror the beauty and intensity of the dancers. This dance group is nothing short of astounding. I've seen ballet in Edmonton, Toronto, and London - and frankly I suspect the Shumka dancers could outdance most ballet dancers with ease, and with every bit as much grace and dignity. 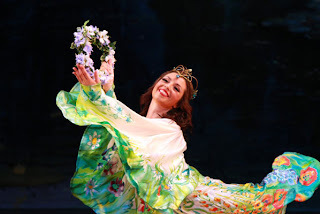 The choreographers have taken the dance troupe from being "just" Ukrainian dance to being contemporary dance that could play anywhere in the world and be not only appreciated but adored. There is something a bit beyond words about it all, really, as Shumka is something one must see, not hear described - and if you missed it I am genuinely sorry as you missed something that cannot really be experienced unless seen (and once seen can never be forgotten). After the performance the audience (a bit weary from clapping and cheering and standing ovations that went on for several minutes) returned to the lobby where they now discovered a reception. When I heard that the performance for the evening was Shumka I hoped that the food at the reception would be Ukrainian themed - and I was not disappointed. Cabbage rolls and pierogies (holubsti and varenyky/pyrohy to the Ukrainians in the crowd) dominated the selection, and it was the perfect end to a perfect evening of entertainment. We had one final glass of wine, and a plate of food. We shared a few more moments with friends, and then we climbed back into a taxi and headed for home. And we had had a marvellous evening. You see, we had gone to a curtain raiser and we had seen Shumka at 50 - and at their finest. We had seen Keyano Theatre, shining brighter than ever perhaps, as it enters into another year of providing quality, diverse entertainment to our community. And we had enjoyed wine, and dance, and food, and yet another one of the amazing entertainment offerings in our city. The next time someone - anyone - complains about there being "nothing to do" here I am going to take out my daytimer - and beat them with it. They won't enjoy the experience, either, because the sheer weight of the ink in it makes it a deceptively heavy little book, crowded with events and places and times and notes on all the things I try to attend here (and I fail, people, I fail, because occasionally I need to do laundry - and sleep). This past weekend alone I went to a rock concert one night and a cultural dance event the next. 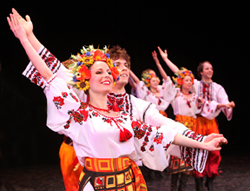 I danced to rock music and I clapped along with traditional Ukrainian dance rhythms. I tried several different varieties of wine from a local group of wine lovers, and I ate Ukrainian food from a local restaurant that offers an incredible variety of cuisine. I spent time at one of the most amazing recreation centres in the country (MacDonald Island) and I spent time at a local theatre that has presented some of the most incredible entertainment in the country. And I marvelled at how this little community has become a place where there is never "nothing" to do. In this city there is always "something" to do, people - and this weekend I did it, from rock music to Ukrainian dance.